Home > Staff > Oregon Trail and Conestogas: Really? Oregon Trail and Conestogas: Really? Wait a minute—is this a trick question? It is partly true…and partly, not so much. I just didn’t realize when I saw that old TV western series Wagon Train, or the Jimmy Stewart movie Bend of the River, that not all were Conestogas. 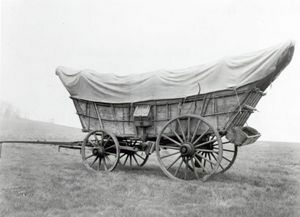 The Conestoga is definitely a covered wagon, and Koerner’s wagons do look like Conestogas, but the image of the Conestoga wagon traveling along the Oregon Trail is basically a myth. Consequently, the heyday of the Conestoga had passed by the time of the Oregon Trail. Plus, they were simply too big and cumbersome to make the trip. From a story produced by the History Channel, I learned that Conestoga wagons originated in the Conestoga region of Pennsylvania around 1725. 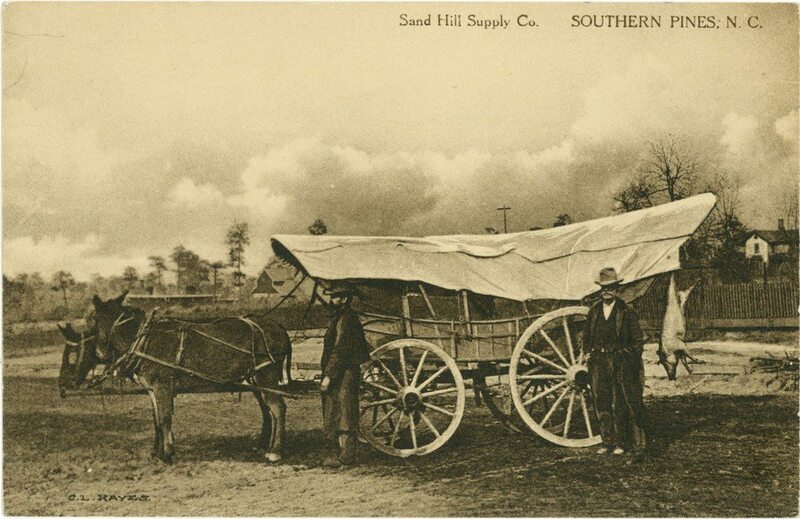 Before the railroads, farmers used them to carry heavy loads of produce (up to eight tons!) to markets. Later, the wagons carried manufactured goods to faraway settlements, and then brought back the frontier produce on the return trip. Soon, transporting goods by way of wagons was big business, and Conestogas became the United Parcel Service of the 19th century! The floor of the Conestoga wagon curved upwards at each end to prevent the wagon’s contents from shifting or falling out, while gates at the end were held in place by a chain and could be dropped for loading and unloading. Over hoops, builders stretched the familiar white canvas top, often soaking it in linseed oil for waterproofing. And, even though the Conestoga looked like a boat, making the Conestoga watertight would have been impossible. “If anyone were to have been so foolhardy as to place the wagon in water, it would have leaked like a sieve,” according to Wilkinson and Beyer. 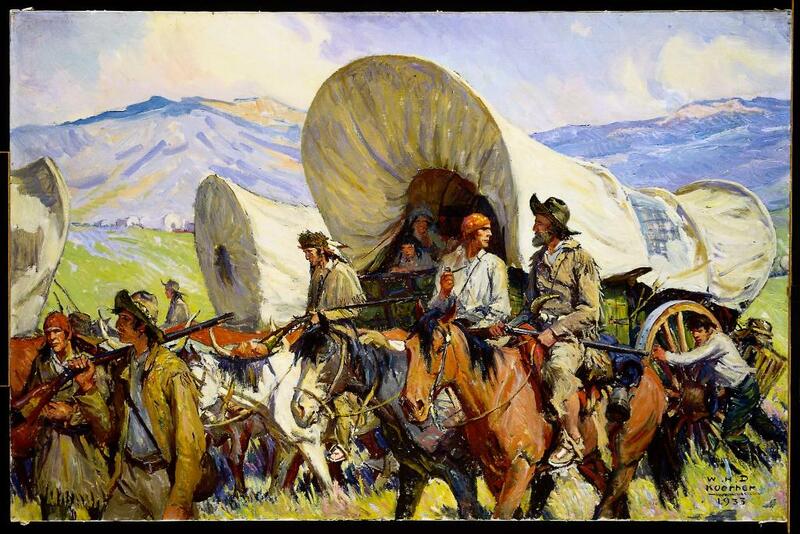 So, the Conestoga wasn’t the wagon of choice for the rigors of the Oregon Trail, but we so love “poetic license” or “artist prerogative” that places them in movies, television, literature, and of course, our wonderful art collection here at the Buffalo Bill Center of the West. Don’t miss it: on site or online. Marguerite House serves as the Center of the West’s Acting Director of Public Relations and editor of its member magazine, Points West. Following a seven-year stint as Business Manager for the Cody Country Chamber of Commerce, Marguerite moved “across the street” to the Center in 1999. Since then, she’s held five different positions in three of the Center’s four divisions, landing in PR in 2005. “I think that gives me all kinds of perspectives for our readers,” she says. When not at work, she enjoys writing (especially a weekly column for the local newspaper called “On the House”), cooking, and spending time with her six grandkids.